A Devon fun farm is reaping the rewards of a nine-year breeding programme for miniature pigs. The pigs, which are about a fifth of the size of ordinary pigs, have been a hit with visitors at Pennywell Farm. TV celebrity Jonathan Ross bought two of the pint-sized porkers as pets at £150 each and there have even been offers from as far away as Australia. The pocket pigs are a variant of the rare kune kune breed, which are found in New Zealand. Chris Murray, co-owner of the farm near Buckfastleigh, began cross-breeding the pigs nine years ago and believes he has the perfect pet pig. He said: "Pigs are very cute when they are young, but they outgrow a home environment and can be aggressive when they get older. "These pigs are just at home indoors or outdoors." 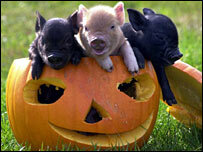 Some pet pigs, such as the Vietnamese pot-bellied variety, have in the past been bought for their cuteness. But they fell out of fashion when it became clear how big they grow. The world's smallest pig is thought to be the 28in-long wild pygmy hog, an endangered species which lives in wildlife sanctuaries in Assam, India. Mr Murray said: "They are easy to house train and have a good temperament. "A sow would normally snap at you if you picked up one of her litter, but these are amazingly content." "They are too small, he said.